The Human Body can adapt and over come the most difficult situations. The gentleman known as Dwain St.Julian brings a host of experiences to the fitness and nutrition arena. Growing up as a child with chronic asthma, which kept him in and out of the hospitals, did not do much justice for the development for his already small frame. This caused Dwain to have a very ‘picky’ appetite since he was practically always ill. Over the years he lacked the proper nutritional support and physical activity needed to make him healthy enough to excel in sports. After going through twelve years of school being a ‘skinny kid’, Dwain decided to change his body and his lifestyle. While attending Prairie View A&M University, Dwain would come to be on the university bodybuilding team where he gained a lot of useful information and a different perspective on ‘high-intensity training’. From the time of his inception to the university’s bodybuilding and power lifting team, Dwain felt the need to pass on his knowledge of fitness and health to others. He then started to help family, classmates and professors with the basics on changing one’s ‘Lifestyle’. – For those individuals or groups who are serious about enhancing their quality of life, change that number on the scale, or just have more energy, Dwain St.Julian will empower you with the knowledge, insight, vision and faith required to help you achieve your goals! 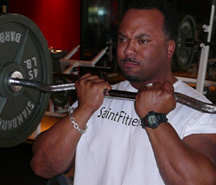 Saint Fitness often posts updates on our social-media pages.